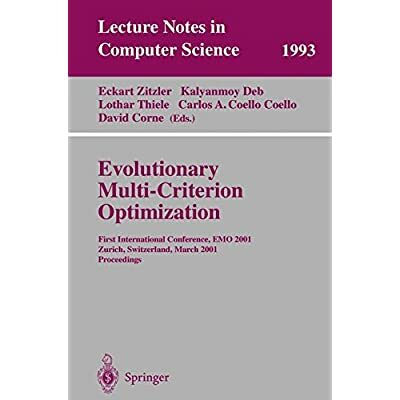 This book constitutes the refereed proceedings of the First International Conference on Multi-Criterion Optimization, EMO 2001, held in Zurich, Switzerland in March 2001.The 45 revised full papers presented were carefully reviewed and selected from a total of 87 submissions. Also included are two tutorial surveys and two invited papers. The book is organized in topical sections on algorithm improvements, performance assessment and comparison, constraint handling and problem decomposition, uncertainty and noise, hybrid and alternative methods, scheduling, and applications of multi-objective optimization in a variety of fields.